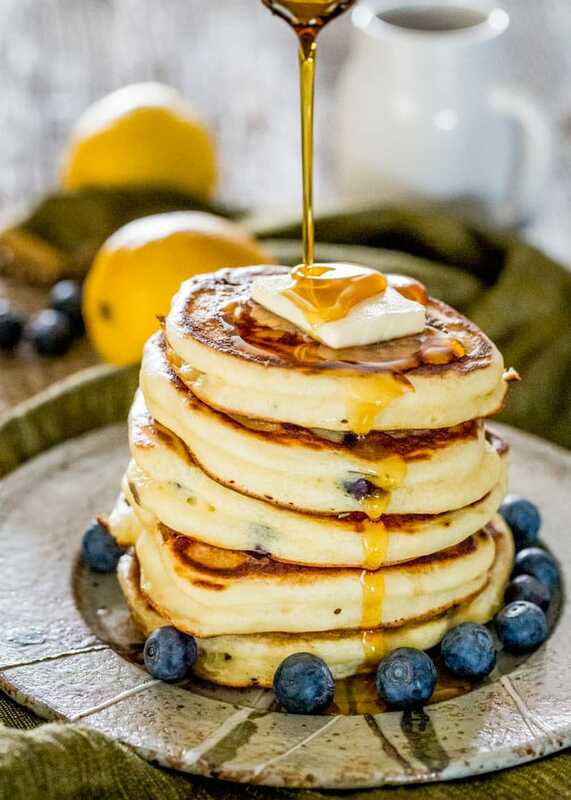 These luscious Lemon Blueberry and Ricotta Pancakes are made with lemon juice, blueberries, ricotta, salt and vanilla, topped off with maple syrup and butter. Lemon and blueberries together are two ingredients that make me smile from ear to ear. When the two are paired together, well let’s just say that delicious things happen and it totally warms the cockles of my heart! It even takes such a simple recipe as pancakes and amplifies it to the nth degree. And then when you add ricotta in that mix, well let’s just end this now because you’ll just have to try these pancakes to believe me. 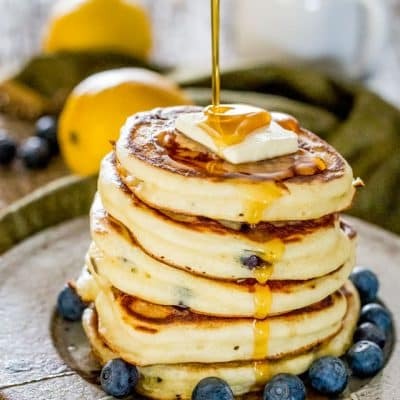 I was going for nice thick and fluffy pancakes loaded with blueberries and loads of lemon flavor so that when you take a bite into one, you get a burst of blueberries enveloped by lemon flavor, maple syrup, and a touch of butter. I am a pancake person, not going to lie to you, I can have pancakes for breakfast, lunch or dinner, and I have. I love all breakfast food, probably because most breakfasts include bacon, and well we all know how I feel about bacon. That’s fine, relax, I did not add bacon to these pancakes, but if you wanted to add a side of bacon when serving these, who am I to argue with you, as a matter of fact you might become my BFF. If tomorrow morning you find yourself brewing a hot pot of coffee and wonder what to have for breakfast then try these. What better way to start your weekend then with these fluffy pancakes? Now you have a reason to go shopping, buy some blueberries, some gorgeous lemons and ricotta cheese. If you find yourself with leftover ricotta and aren’t sure what to do with it, add a bit of cocoa powder to it, a bit of sugar and just eat it like that. It’s really good, trust me. Try these amazing breakfast recipes if you loved this one! In a large bowl whisk together the flour, baking soda, baking powder, sugar and a pinch of salt. Set aside. In a smaller bowl whisk together the vanilla extract, milk, eggs, ricotta cheese, lemon zest and lemon juice. Add the wet ingredients to the flour mixture and gently whisk until well incorporated. Stir in the blueberries. Pour about half a ladle onto a medium hot griddle and cook for 3 minutes, until the edges start to firm up. Flip the pancakes and finish cooking for another 1 to 2 minutes on the other side. Repeat with remaining batter. You can use any berries you like for this recipe. Blackberries, raspberries, strawberries, etc, or any combination. This recipe will yield about 18 small to medium pancakes. Nutritional information assumes 3 pancakes per serving and does not include maple syrup and butter. Your pancakes look very tall and fluffy. Is it necessary to whip the egg whites separately and then add to the batter. I know yours doesn’t call for this and I’m just wondering if they might come out a bit flat since ricotta is heavy. The reason they come out so tall is because there’s a lot of baking powder in the batter, and a touch of baking soda. No need for whipped egg whites! After eating these my family will not eat any other her pancake. 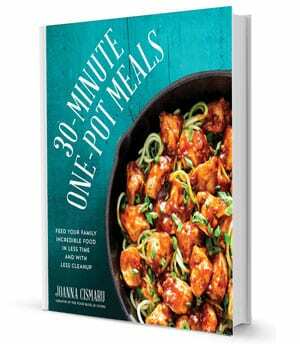 Hi Jo, thanks for sharing your recipe, I tried it, and we loved it. I followed the recipe completely, and made 8 nice medium sized pancakes. We ate two, I froze the other six in portions of two, for easy weekend brunch. I will make it again for sure and also recommend it to anyone. Note: my batter was rather stiff so I had to add more milk twice, to get a consistency I thought was good enough before I could add the blueberries. It worked out great, Merci. Delicious!! I tried this recipe to duplicate pancakes I had at a famous restaurant at Pike’s Place. These were even better. Best of all, these freeze very well. Thanks for sharing. I’m so happy to hear that, glad you enjoyed them! I’m order to fit into a low sodium diet I substituted 1 teaspoon EnerG baking soda and 2 tablespoons EnerG baking powder for traditional called for in recipe. They were delicious! These were a hit! Thank you so much for this recipe! Next time I will use a griddle for a more prestine look! 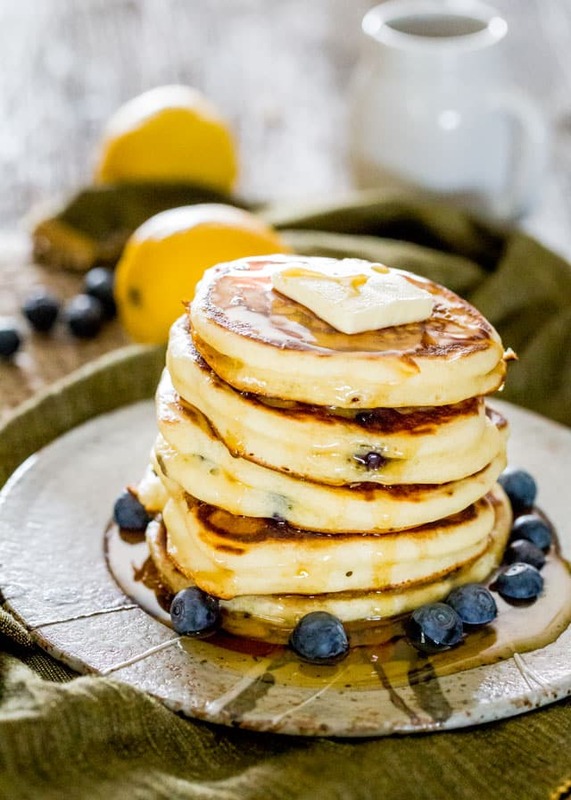 Major snow day here in CT so I made the lemon Blueberry ricotta pancakes today for my family!! They were delicious!!! Thank you!!!! Hey Diane! So glad you liked them, see that’s what snow days are good for! Is it okay to freeze the pancakes? Does anyone know if this batter will hold well overnight in the fridge if I make it the night before? I never know when dealing with baking soda/powder if I can leave it sit in the fridge or if I have to use it ASAP… Thanks! Can’t wait to try them! Becky, I am not sure about over night but I do always let my batter rest for 30-60 mins. What’s wrong with making your own pancake batter? I’ve never thanked you before for your fabulous recipes (and we’ve enjoyed many) but these pancakes were TO DIE FOR !!!!!! THANK YOU!!! My hubby and I enjoyed them this morning for breakfast and I already want more tomorrow. The only “mistake” I made was to not read the recipe a second time and just assume I knew it – so I used the juice of an entire lemon (1/3 C.), not just 2 T. and I will make the same mistake again – we loved the lemony flavor so much. Without exception, every recipe of yours that we’ve tried has been AWESOME. Keep ‘um coming, pleeeeeeze. I’m so glad you enjoyed this Ann!!! I don’t think 1/3 cup of lemon juice would have bothered me, I love lemon! I am a pancake person myself. Not necessarily for breakfast, more like dessert or sweet main dish. I could have them at least once a week, in any possible form. I love this version, they are so fluffy and nice. 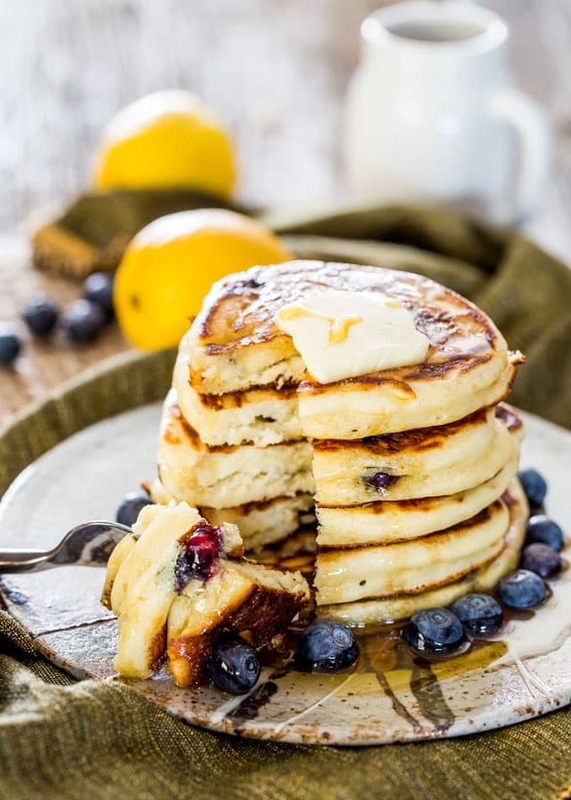 I would have pancakes all day everyday too…Love the ricotta twist! These would be great for dinner, too! So fluffy! 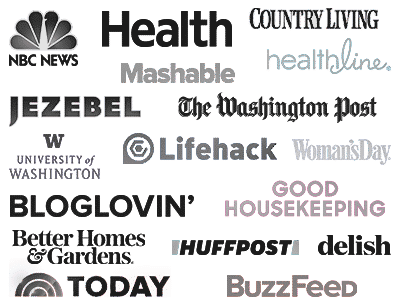 Love this recipe…..all the things I love! Pinned. Thanks for sharing and the tip about leftover Ricotta Cheese. These look fantastic and I would eat these for dinner, easily. They have all the right components and flavors for me. My two dogs Kodi and Oliver are salivating too and say hello to Mia!